Ayyy!! I've wanted to make something like this ever since I saw someone suggest it on Redbubble. Something more than stickers, a design for T-shirts and stuff! Characters are (top left/right) : Bluestar, Tigerstar, and Scourge. (mid left/right) : Tallstar, Silverstream, Cinderpelt, Yellowfang. (bottom left/right) : Greystripe, Fireheart, Ravenpaw. Depending on the response, I may make one for the other series' as well. YES YES YES! YOU SHOULD ABSOLUTELY DO MORE, I LOVE IT!!! Man River, this is a really cool design! I'd love it if you could do the other series as well. I would love to see your designs for Dawn of The Clans especially! Hoi! I just LOVED the design you made, it's so magical! I guess I know what I'm asking for on Christmas or my birthday. river, i have grown so much because of you! i improved my cats from watching your vids on youtube, and i've always wanted to say thank you! when i first started drawing cats, i would sit outside and all my hope would drain when i looked at the picture and threw it away. and that time was a very tough time for me and my mom; we were living with my aunt and uncle that had two kids, boy and girl. the girl, 4, would call me names, taunt me, kick me, just everything. she honestly made me feel bad about myself. but, when i discovered your channel, i held onto hope and i got to as good as i am now! i just have to say, thank you! you are my inspiration for when i'm feeling sad or helpless on the days i am stressed or upset. holy starclan!! this is amazing! i would def get it on like a phone case or as a sticker! Definitely going to put the hoodie on my Christmas list, I love the design so much! But why is Sandstorm not around? I think she plays a bigger role in the first series, as a 'small antagonist' turned main protagonist, than let's say Tallstar does. Not that I wouldn't include him, but I think her inclusion would have made me enjoy this awesome cover just a tiny tad more. 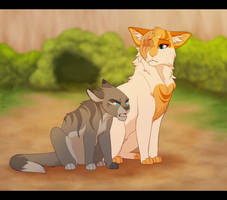 I thought that Tallstar was Spottedleaf for a moment and Silverstream was Sandstorm until I looked in the description. Love how you did Tallstar! The perspective looks very nice and the characters are super appealing and vibrant!!! Fantastic detailing and color shading and blending!!! wow this made it to the front page!!!! Omg, I’m honored by thy presence, mighty troll! ...why bring the whole fandom into one picture? Why did you go out of your way to comment something unnecessarily rude on someone's art lol? Y did u go out of ur way to reply to it. Because the artist did nothing to provoke you and I believe in defending people. They put it in the public, it can be called whatever becuase I have the power and the creator posting this on a public platform is allowing said power, and I liked thier art but I don’t like warrior carts and this was on the main page so pls, stop wasting both of our time with this pointless argument. This is an argument? I didn't consider it one. Just because you have the power to do something doesn't mean you should. Using "it's on a public platform" as your justification for an unnecessary comment that isn't beneficial whatsoever is just pitiful. Yes it is. Two people with opposing opinions are attempting to justify the other in a series of sentences going back and forth, an argument. And it is justifiable. if you were to post anything on the internet tha can be viewed in public, it can be criticized or insulted whether the creator or other people wants to or not. This can abide to anything. Now can you stop arguing I have things to do that doesn’t include arguing with furries. No offence, while your art is alright, it's not better than this art whatsoever. You have a lot to improve on and that's just me saying at first glance both this persons art and yours. It’s cool, I like their art. Not the series. I never read it but the art is nice.